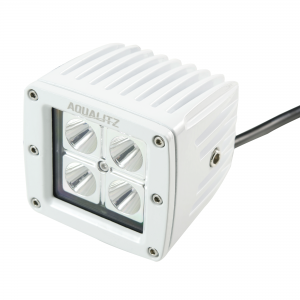 The AquaLitz™ by Alpena® QuadFire™ is a compact but powerful LED pod light featuring precision optics that provide an intense spot beam output. Designed to be mounted on marine exteriors in a variety of boats and other uses. Rated for 1500 lumens, the QuadFire™ uses the Cree™ LED for a higher lumen-per-watt output. A shockproof and waterproof alloy housing is IP65 rated for longevity and durability while each LED has a 50,000 hour lifetime. Includes four pre-cut LensArmor™ films to protect the lens and change the color of light output. 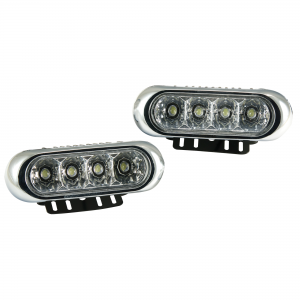 Use the QuadFire™ as a docking light, spot light, utility light or as a reverse light for trailering. Installs on any 12-24V DC system. 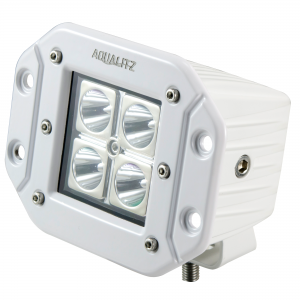 The AquaLitz™ by Alpena® QuadFire™ is a compact but powerful LED pod light featuring precision optics that provide an intense spot beam output. Designed to be flush mounted to marine surfaces in a variety of boats and other uses. Rated for 1500 lumens, the QuadFire™ uses the American designed Cree™ LED for a higher lumen-per-watt output. A shockproof and waterproof alloy housing is IP65 rated for longevity and durability while each LED has a 50,000 hour lifetime. Includes four pre-cut LensArmor™ films to protect the lens and change the color of light output. 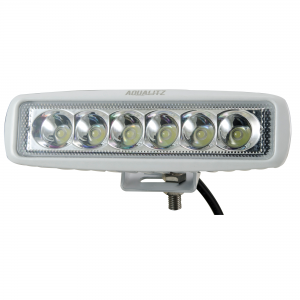 Use the QuadFire™ as a docking light, spot light, utility light or as a reverse light for trailering. Installs on any 12-24V DC system. 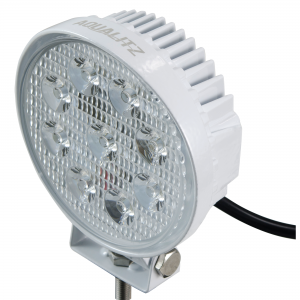 The AquaLitz™ by Alpena® WorkLED 4™ is a compact and power efficient LED utility light with an output of 800 lumens. Featuring a heavy duty aluminum cast housing, a shatter proof and UV resistant lens and an adjustable angle mount this lamp is durable and versatile. 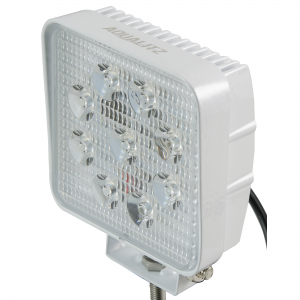 Projecting a bright 30° flood beam, WorkLED 4™ uses four 3 watt Samsung LEDs for high efficiency and clean white output. Great for additional light on dedicated work boats, for fishing boats, for wake towers, and for use as docking lights. Includes four pre-cut LensArmor™ films to protect the lens and change the color of light output. A shockproof and waterproof housing is IP65 rated for longevity and durability while each LED has a 50,000 hour lifetime. Installs on any 12-24V DC system. 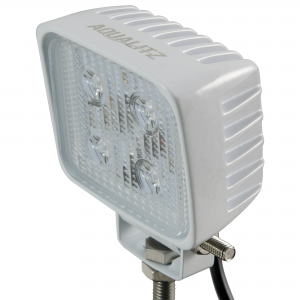 The AquaLitz™ by Alpena® HexFire™ is a small LED light that provides an intense spot beam output using six bright white LEDs. Rated for 1200 lumens, the HexFire™ employs the American-made Cree™ LED for a higher lumen-per-watt output. A shockproof and waterproof alloy housing is IP65 rated for longevity and durability while each LED has a 50,000 hour lifetime. Includes four pre-cut LensArmor™ films to protect the lens and change the color of light output. A pivoting, adjustable mount ensures ease of install and a full range of adjustment for aiming purposes use the HexFire™ as a docking light, spot light, utility light or as a reverse light for trailering. Installs on any 12-24V DC system. AquaLitz™ by Alpena® DockLitz 4™ are compact and energy efficient LED spot lights that have a variety of different exterior uses. Mounted using an adjustable angle swivel mount, DockLitz 4™ are great for use as docking lights and deck lights and can add visibility for safety and utility. Featuring 4 bright white LEDs per unit, DockLitz 4™ consumes less energy than incandescent lights. Installs in any 12V DC system. 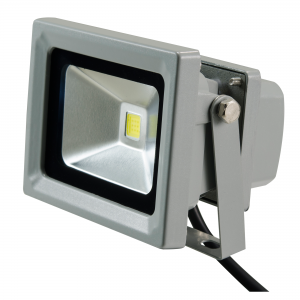 The AquaLitz™ by Alpena® Workbrite 10™ is a wide angle LED floodlight built for utility purposes. Using the latest C.O.B (chip on board) LED technology produces a large amount of light with lower power consumption and heat with a bulb life of 50,000 operating hours. IP65 certified for longevity and durability, the Workbrite 10™ illuminates areas while docking, trailering, fishing, and is a great choice for general utility lighting on boats of all sizes and styles as well as trailers. A pivoting, adjustable mount ensures ease of install and a full range of adjustment for aiming purposes. Installs on any 12-24V system.